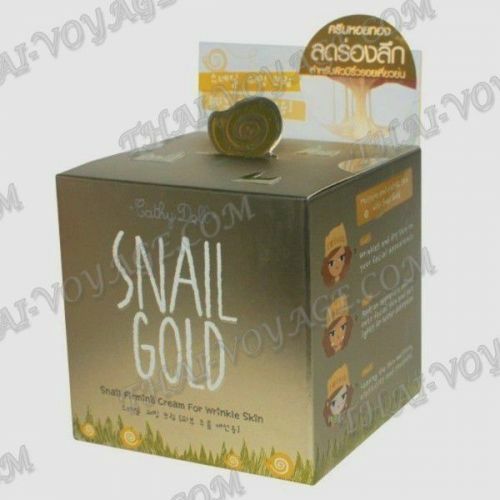 Cream Cathy Doll Snail Gold contains snail mucus, strengthens the skin, improves elasticity, smooths wrinkles. All components of the snail cream aimed at the restoration and rejuvenation of the skin of the face and neck. The cream stimulates the production of collagen and elastin, improves complexion and moisturizes. Easy Thai cream delicate texture, enriched with snail slime filtrate, intended for tired and weakened skin. Cream is ideal for dry and combination skin. It perfectly smoothes wrinkles and evens skin tone. Immediately after application is absorbed into the skin without a trace, lighten pigmentation, moisturizes and firms. Shea butter has soothing, moisturizing, strong protective and restorative abilities. Improves firmness and elasticity, improves skin turgor, smooths wrinkles, improves the complexion. Macadamia oil is famous as a rejuvenating and regenerating oil that restores skin to its former tone, firmness, elasticity and hydration. Hyaluronic acid is responsible for retaining water in the intercellular space, helps the skin to be elastic and moisturized. In addition, accelerates the synthesis of collagen and elastin. The snail slime – the slime of snails is a unique natural ingredient, preserving and prolonging youth. Refreshes, regenerates the cells, smoothes scars after acne, tightens pores. Increases skin elasticity, deeply moisturizes and smoothes wrinkles. Protects from photo aging, lightens age pigmentation, improves complexion. Aloe stimulates cell regeneration, improves the structure of the skin, giving it softness and elasticity. Relieves inflammation and irritation, eliminates puffiness, helps to narrow pores. Sesame oil maintains skin elasticity, helps to eliminate toxins, slows the aging process. Soy extract easily retains moisture in the skin, smoothes wrinkles, protects the skin from hormonal aging. Used for anti-aging line of cosmetics. Rice bran oil makes skin softer, eliminates inflammation, gives elasticity, prevents wrinkles, stimulates the regeneration processes in the cells. Sage extract helps to preserve youthfulness, smoothes wrinkles, protects from environmental aggressors, nourishes and tones the skin. Rooibos leaf extract – antioxidant, reduces the negative effects of UV radiation, slows the degradation of collagen and elastin. Gold 24K effectively fights wrinkles and the first signs of aging of the skin, restores its freshness, radiance and youth. Promotes skin tightening of the face and neck. Does not cause irritation.